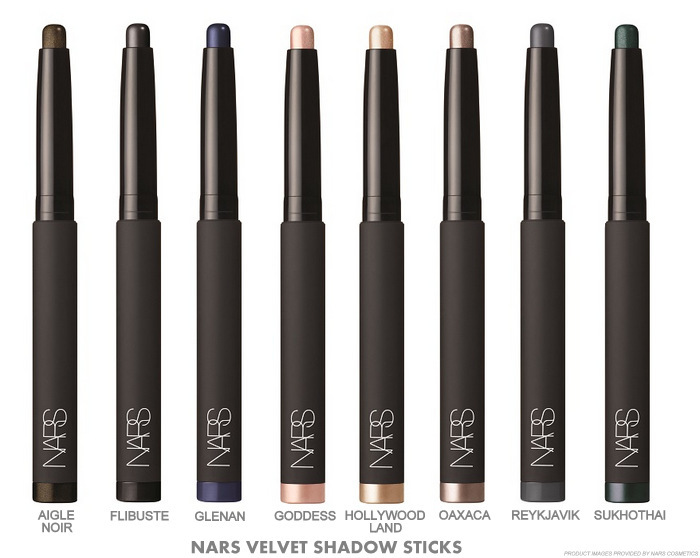 The NARS Velvet Shadow Sticks are a new-to-me product launched with the Fall 2015 makeup collection and are a definite improvement (at least to me) over the Soft Touch shadow pencils. 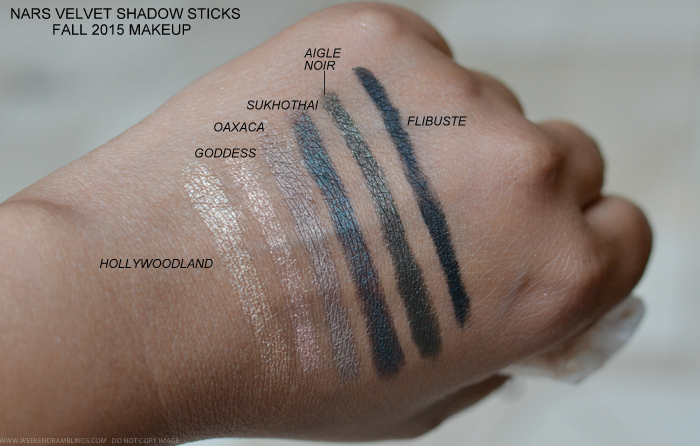 These are like cream eyeshadows and are available in a few neutrals as well as some deep rich colors. 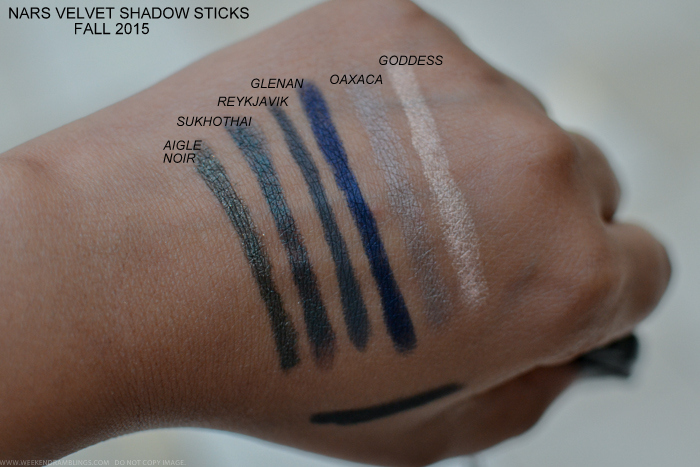 Can be used on their own or as based under other eyeshadows. 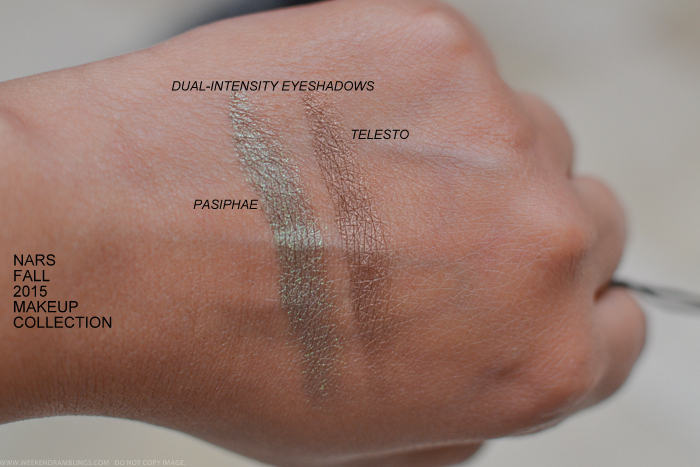 The collection has two new Dual-Intensity Eyeshadows - Pasiphae and Telesto. Pasiphae is a beautiful brownish green that seemed a little sheer on my skin. Pairing it with one of the darker shades from the Velvet Shadow Sticks like Sukhothai or Aigle Noir would intensify the color. Telesto is a lovely golden brown color that I could use any time of the year. 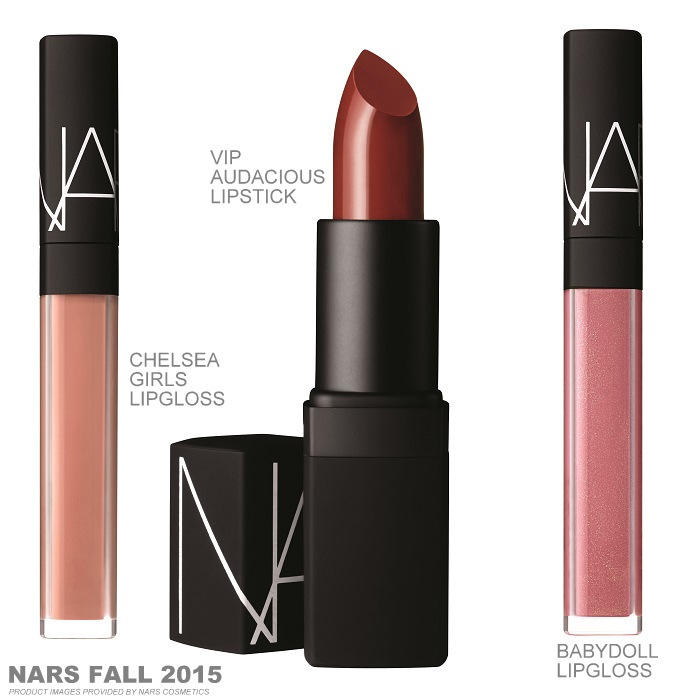 For lips, the NARS Private Screening Fall 2015 makeup collection includes a semi-matte brick red lipstick - VIP Red - as well as two lipglosses - Chelsea Girls and Baby Doll. Of the three, my favorite would be the Chelsea Girls lipgloss. VIP Red is the perfect rich, warm, autumn shade. The collection also includes a beautiful blush - Tribulation. I did swatch this in store but unfortunately seem to have deleted the photo (you can catch a blurry glance of it at the bottom of previous photo). While NARS labels this a blush, on my darker (Indian) skin tone, it's actually a beautiful soft golden-beige highlighter and is my favorite product in the entire collection. Do give it a try in store, and I will try to update with a swatch here - not sure when. 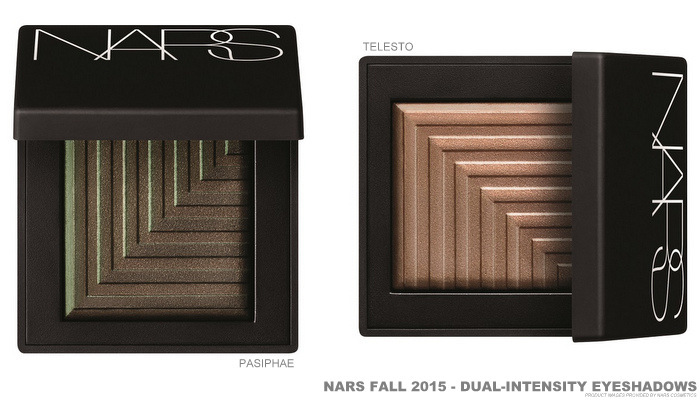 Another new launch from NARS, though not really part of the Fall 2015/Private Screening Collection are the NARS Audacious Mascara and a new twist-up pencil eyeliner - Kohliner. 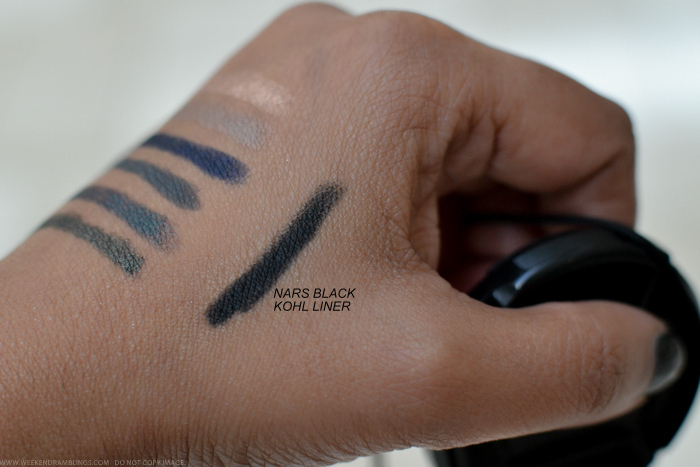 The shade launched now is a black matte - Minorque. Links provided in the post are for information only and are NOT affiliate/sponsored links. 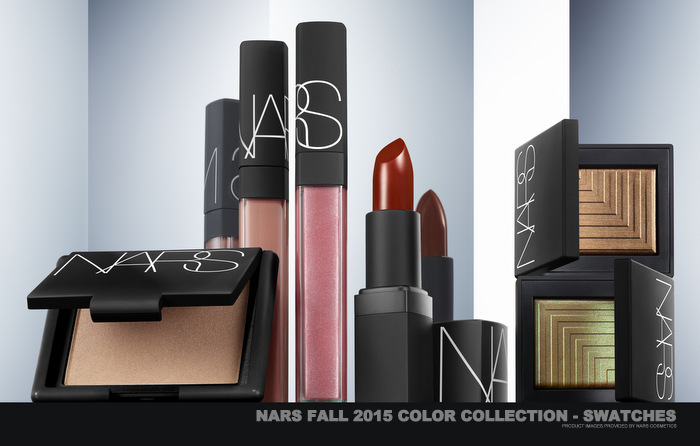 Product images have been provided by NARS Cosmetics (as mentioned on the images).